Portable Folding Hand Carts Combine Heavy-Duty Material Handling with Easy Fold-Up Storage. Portable Folding Hand Carts allow easy material handling, transport and long lasting durability. Collapsible for easy storage in closets, compartments and cars. Frame types include ABS, steel, aluminum and rubber. Capacities range from 80 to 550 lbs. Wheel types are pneumatic, polyolefin, rubber and semi-pneumatic. Folded dimensions vary per type. Collapsible Rolling Crates Combine Reliable Material Handling with Easy Collapsible Storage. Collapsible Rolling Crates efficiently transport paperwork, office supplies, tools and more. Rolling Crates are plastic with a telescoping aluminum handle, and non-marring rubber wheels allow smooth transport and provide long lasting durability. 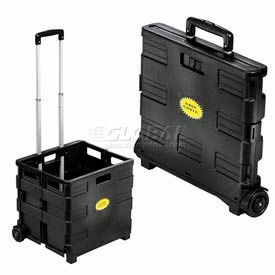 Collapsible Rolling Crates fold down to the size and shape of a small briefcase for easy storage when not in use. Weight capacities are 50, 55 and 80 lbs.. Dimensions vary per style. Olympia Tools Pack-N-Roll® Folding Cart is Heavy Duty Canvas with Storage Pockets for Organization of Documents and more. Olympia Tools Pack-N-Roll® Folding Cart is made of ABS, steel, nylon and rubber to provide long lasting durability. Main zipper pouch holds notepads or books and multiple pockets provide separate storage for smaller items. 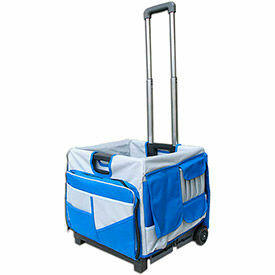 Removable rails turn carrier into a foldable rolling Cart that works like a filing cabinet. Telescopic handle has push button operation. Cart folds down to 3" for easy storage when not in use. Weight capacity is 50 lbs. Folding Hand Trucks Combine the Durability of a Full-Sized Hand Truck with the Flexibility of a Compact Folding Truck. Folding Hand Trucks are made using aluminum for lasting durability and a lightweight build. 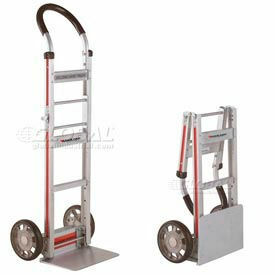 Folding Hand Trucks may be used as full-sized Hand Trucks, or folded down for easy compact storage. Trucks roll easily on large rubber wheels. 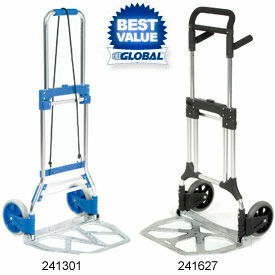 Hand Truck capacities range from 250 to 500 lbs. Choose from several trusted brand names.